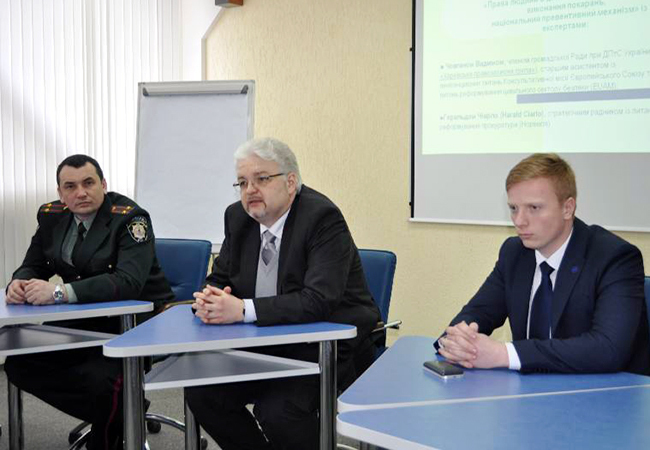 Two experts from the European Union Advisory Mission (EUAM), Harald Ciarlo and Vadym Chovgan, together with the President of the European Committee for Prevention of Torture, Mykola Gnatovskyy, delivered a training session for Deputy Heads of Ukrainian penal institutions on 4 March 2016 on the subject of human rights. The session was delivered at the Bila Tserkva School of Criminal and Executive Service of Ukraine with the title “Human rights in the activities of penal institutions and the national preventive mechanism”. The session underlined the measures any penal institution has to take to meet the provisions of the European Convention for the Prevention of Torture and Inhuman or Degrading Treatment or Punishment and the Standard Minimum Rules for the Treatment of Prisoners. Discussions also focused on the regime for prisoners as well as their work and living conditions. These are the main areas that the Committee for Prevention of Torture (CPT) inspect during their visits to detention centres. “The European Committee for the Prevention of Torture standards and recommendations are those ideals that steer the Ukrainian prison system towards better implementation of human rights and best European practices. They are also the keys for improving human rights overall in Ukraine as well as in Europe”, highlighted Vadym Chovgan, Penitentiary Reform Officer at EUAM. The international experts emphasised the power of CPT to uncover and follow up on abuses of human rights in prisons. They noted that recently Ukraine had to pay a large fine for violating the human rights of prisoners.